Transparency Market Research (TMR) has published a new report titled ‘Dental Biomaterials Market - Global Industry Analysis, Size, Share, Growth, Trends, and Forecast, 2018–2026.’ According to the report, the global dental biomaterials market was valued at over US$ 600.0 Mn in 2017. It is projected to expand at a CAGR of 5.8% during the forecast period from 2018 to 2026. The global market is anticipated to be driven by a rise in the prevalence of oral diseases, increase in the geriatric population, and rise in the adoption of dental implants across the globe. 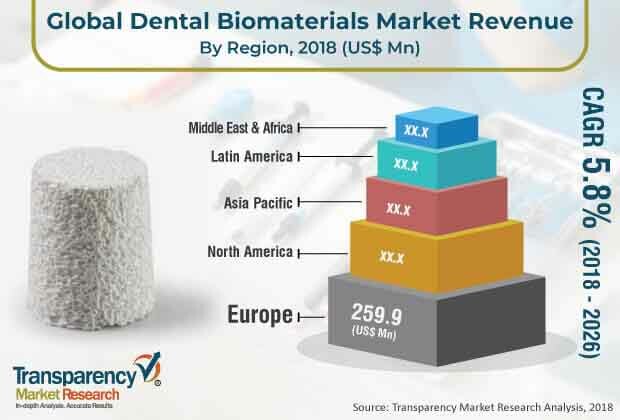 The dental biomaterials market in Asia Pacific is expected to expand at a high CAGR of 6.6%, due to a rise in the target patient pool with dental disorders, increase in dental implant procedures, and increase in dental tourism in emerging countries such as India and China. A rise in the geriatric population across the world is a major driver of the market. For instance, according to a 2017 United Nations Report, the number of people aged 60 years and above is expected to increase two fold by 2050 and is projected to reach 2.1 billion in 2050 from 962 million in 2017. Periodontal disease and tooth loss and decay are highly common dental disorders in the aged population across the globe. For instance, it is estimated that periodontal disease is highly prevalent in the aged population and affects about 20% to 50% of the population across the globe. Thus, an increase in the target patient pool suffering from oral diseases is estimated to lead to a rise in the number of dental surgeries. This, in turn, is expected to drive demand for bone graft substitutes and membranes. This is likely to boost the market in the next few years. In terms of product, the market can be classified into bone graft materials, dental membranes, and soft tissue regeneration products. The bone graft materials segment can be further categorized into allografts, xenografts, and synthetic grafts. The bone graft materials segment is projected to account for a leading share of the global market during the forecast period, owing to an increase in the usage of bone grafts for dental implant fixtures, bone growth, and reconstruction. Bone grafts replace the missing bone with materials in order to regenerate and heal the bone around surgically implanted devices such as dental implants. Thus, the segment is expected to expand at a strong growth rate in the next few years. Based on application, the global dental biomaterials market has been segmented into implantology, periodontology, and others. The implantology segment dominated the global market in 2017. It is projected to expand at a high CAGR during the forecast period, owing to an increase in implant penetration across the globe. A rise in focus of patients on esthetics to improve their facial appearance and an increase in the edentulous population have led to an increase in implant procedures worldwide. These factors are expected to drive demand for dental biomaterials, which are used significantly in implant procedures. In terms of region, the global dental biomaterials market has been segmented into North America, Europe, Asia Pacific, Latin America, and Middle East & Africa. Europe is projected to account for a leading share of the global market during the forecast period, owing to high penetration and adoption of dental implants in European countries including Spain, Italy, and Germany. An increase in implant procedures in the region drives demand for bone graft substitutes for additional bone support during implant placement procedures. The dental biomaterials market in North America is expected to expand at a substantial growth rate over the forecast period, due to the presence of an elderly patient pool suffering from dental diseases. The market in Asia Pacific is likely to expand at a rapid pace in the next few years. Presence of a large geriatric patient pool with periodontal disease in countries such as India and China is expected to provide lucrative opportunities to the market in the near future. Moreover, an increase in focus of leading players on emerging countries is further anticipated to propel the market in the region. For instance, in October 2016, Geistlich Pharma AG established Geistlich Pharma India Pvt. Ltd., a wholly owned subsidiary and tenth global affiliate of the firm in order to penetrate the untapped potential of emerging markets. Key players profiled in this report are Geistlich Pharma AG, 3M, Zimmer Biomet, Dentsply Sirona, Institut Straumann AG, BioHorizons IPH, Inc., Danaher Corporation (Nobel Biocare Services AG), ACE Surgical Supply Company, Inc., and Biomatlante. These players focus on strategic acquisitions, mergers, and new product launches to expand product portfolio and strengthen geographic presence across the globe. For instance, in February 2019, Zimmer Biomet launched OsseoGuard non-resorbable dental membranes used in the treatment of ridge augmentation procedures. The strategy enables the firm to meet unmet clinical needs of clinicians and expand product offerings.